The current traffic situation in a lot of cities around the country is causing frustration to many car owners. Driving to work is becoming a nightmare as you sit in traffic for longer than you used too. That’s why the Porsche Cayenne’s comfort will definitely make this part of your journey a breeze. The next problem so many drivers face is the overcrowded parking areas, badly parked cars and narrow parking spots. Here again our Porsche Cayenne will put you at ease about not getting scratches or marks on your vehicle while trying to maneuver into sometimes impossible spots. Along comes our remote parking assist to save the day. Not only can the Cayenne park itself but it can do so with you standing outside your car watching in amazement as it parks into that awkward spot you thought was impossible to get into. The system has parking recognition features which will measure spots for you as you are driving past. Whether they are on the right or left, even if they are parallel spots, the sensors can automatically measure the parking spots dimensions and determine if your Porsche will fit. With its 12 Ultrasonic sensors and 4 cameras, creating a 360-degree view around your vehicle, parking has never been safer. This information is fed directly into the central driver assistance control unit. This unit uses 4 processors to control 20 additional control units making adjustments continuously. While remote parking with these sensors and cameras, the car is able to detect pedestrians, curbs and obstacles that might be out of view for you as a driver. As an added safety measure, you are able to stop the parking process at any time using the Porsche app. On top of these great mobility helpers is another feature which is definitely a must when it comes to traversing the narrow streets in some cities or tight parking garages – the maneuver assist and curb detection. There is no noise more terrifying than hearing 20-inch rims scraping against a low and awkward curb. This system uses the same sensors to detect the curbs and show the driver exactly where they are and how close they can get without damaging their mags. Putting all these systems together has created a perfect vehicle that can get you out of or into a sticky situation. 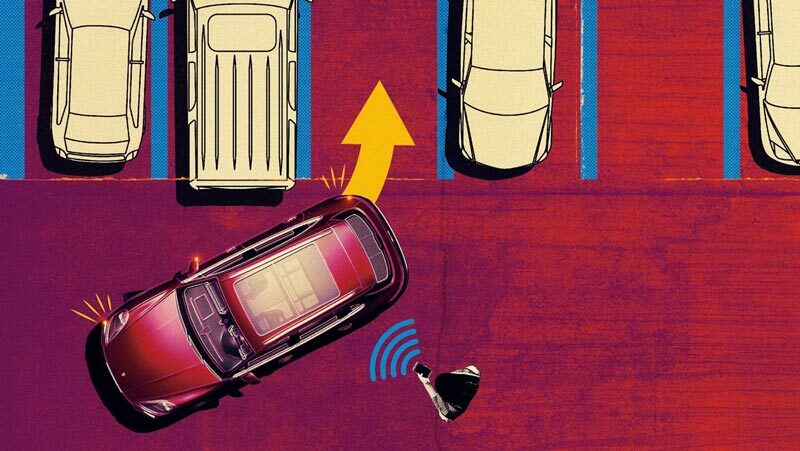 The system will automatically measure parking spots in a parallel situation, and inform you if the car will fit. You can park your vehicle while seated behind the wheel or standing beside it. The car is also fitted with an egress warning that will keep you safe before disembarking from your car in a traffic area. The reverse warning sensor adds an extra layer of safety as it will warn you when reversing from a park, even breaking for you if required to avoid a collision. There is even parking assist for launching your boat which will take over steering. All you do is set the angle of entry and it will do the rest for you. As a whole package this new system has put the Porsche Cayenne head and shoulders above the competition with its Remote park assist. Porsche have taken the one of the most annoying elements of driving and turned it into the simplest. Parking your car has never been as easy with the new system. Just because the Cayenne is slightly broader we don’t see why you need to be punished when it comes to parking. © 2019 Porsche Hangout All Rights Reserved.